THE 250 berth Lough Derg Marina in Killaloe/Ballina is being offered for sale, with an asking price in excess of €500,000. Situated on the Ballina shoreline, the marina is on an 3.17 hectare (7.8 acre) site with over 500 meters of lake frontage that enjoy panoramic views of the lake and surrounding countryside. The site includes a workshop/warehouse, ancillary offices, ground floor showroom, storeroom and an adjoining two bedroom first floor apartment. Zoned for mixed use general development, the property may suit planning permission for a new marina or a mixed development, incorporating a water related development, including private and public berthing, cruiser rental, leisure/water related activities, commercial use, holiday and family apartments/ houses or even a small hotel, subject to planning permission. The marina is being offerd for sale by joint agents, CBRE and Costelloe Estate Agents. Killaloe/Ballina are strategically located within 8km of M7 motorway and a short drive to Limerick City and Shannon International Airport. 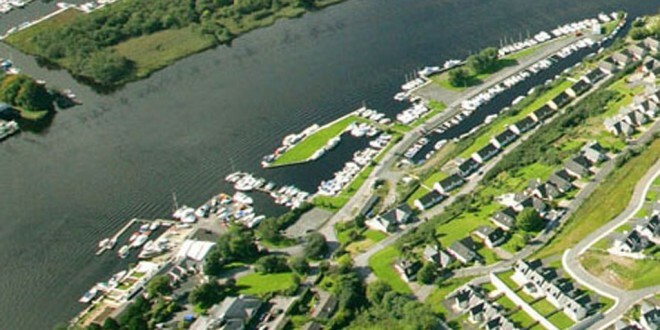 The marina is within a short walking distance of all Ballina/Killaloe amenities, including an array of well regarded restaurants and pubs.